Diploma course in Pharmacy imparts knowledge of manufacturing, synthesis, mode of action, uses and toxic effects of medicines. It deals with study of medicinally important drugs from natural sources. A practical training of 500 hrs., in different hospitals and dispensaries is given to students after completion of two years course. Then are registered as Pharmacist. The trained diploma holders are absorbed in pharmaceutical companies as marketing personnel or as pharmacists in hospitals, dispensaries health centers and different pharmaceutical organizations. Pharmacists share a common commitment to improving people's lives through medicines and care and making a real contribution to the nation's health. 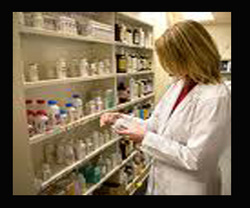 Pharmacy techniciansand aides help licensed pharmacists prepare prescription medications, provide customer service. Diploma in ITES & M has been defined and designed to meet the growing need of KPOs, BPOs and other organizations providing ITEnabled Services. Course Content has been designed to fill vacuum between academics, Computers and IT Enabled Service Sector.Department builds professional competency in students by combining theory with exhaustive practical training. Communication Skills have been given due importance. Elective subjects like IT Laws and Parents, Cyber Crimes, Computer Graphics and Multimedia are being taught besides basic science and core subjects. Department maintains well equipped and modern labs like DBMS, Computer Networking, Multimedia, Software Lab, Web Site Designing Lab, Hardware Lab, Communication Language(English) Lab. After successful completion of the programme, the students can secure jobs at various levels like Programmer, Web Designer, Network Administrator, System Administrator and Database Administrator in KPOs, BPOs and other industries providing IT Enabled Services. Diploma programme in Medical Laboratory Technology primarily aims at imparting suitable training to enable the students to conduct various examinations on body fluids/ tissues and prepare reports They are also taught to use, manage different laboratories, and maintain equipments used in various clinical labs of the hospitals, to communicate effectively with doctors, patients and representatives of business organizations. A diploma holder can be appointed as a laboratory technician in laboratory technician in laboratories of various departments in medical colleges, hospitals and private laboratories.They can also join pharmaceutical concerns. Medical Laboratory Technology is one of the largest and important professions that provide health care. The technologists are skilled scientists who perform tests that aid in the diagnosis and treatment of diseases. As vital members of the health care team, they assist physicians during the diagnosis and treatment of the patients.The syllabus is relevant to the needs of the health sector.